Each player is one of six Giant Monsters, stomping across a map of the USA in search of cities to destroy. The monsters run the gamut from the classic (enormous lizards and gargantuan apes) to the slightly more unconventional (50-foot glow worms, anyone? ), and each has its own set of attributes and powers. Ingeniously, everyone also controls an arm of the military, which can be used to attack and weaken the other monsters on the board. It's a losing battle for the militia -- monsters can wipe out military bases and reduce the total number of forces available to each player -- but you can get a few good licks in early in the game. The battle escalates until the 20th city is reduced to rubble. At that time, all the monsters duke it out in a free-for-all, mano-a-clawo Monster Challenge; and when the dust settles, the last monster standing is declared the winner. 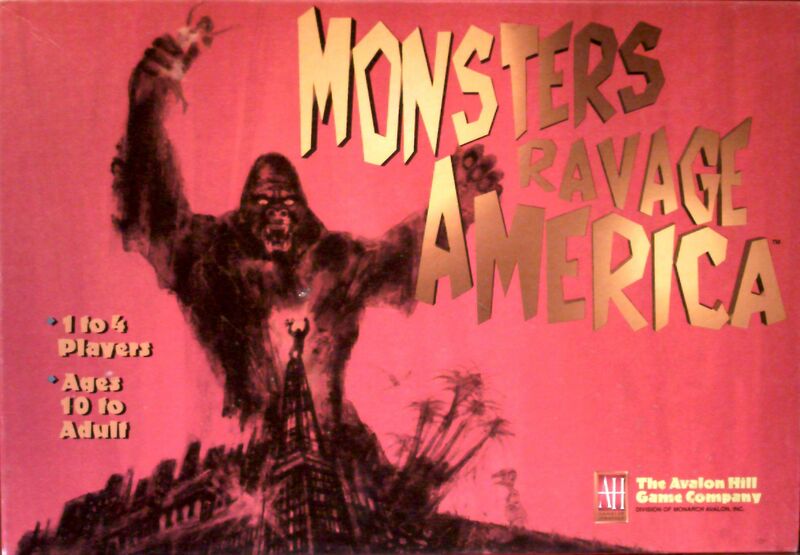 This game was remade into Monsters Menace America.